Well, our week long streak of bear hungry selling was finally put to an end on Tuesday as the Dow closed up 236 points (3.32%). Indeed we were overdue for a good rally as I was actually expecting this rally to hit a couple of days ago. Well, it's here now and it will be very interesting to see the strength of it. Will it just be a quick rebound for profit taking, or may we see some continual recovery over the next couple of weeks? A lot has to do with fate of the banks and how the government manages news that continues to hit the public. 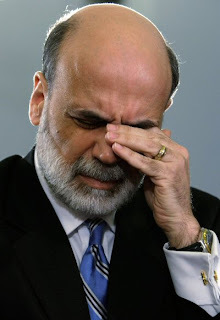 Many people attribute Bernanke's remarks to big run up in financials. However, I don't think he had much to do with it. In my opinion, the market was oversold, and was just waiting for a bit of a push to get the engine started. I see it as a technical rebound, one of which may stick around for a while, at least that is what I am hoping for. The selling volume was very low and the number of new lows were minimal, which was a sign that we were quite oversold. After selling a lot of my gold options last week, I went ahead and got out of gold completely this morning. I do feel that gold still has some more up to go, but I feel that it is vulnerable to some losses here in the short term. The market may regain some of its footing this month, which could bring gold down a bit. I plan on getting back in if we see gold get back down to $900 levels, as I feel inflation will be our next beast to slay after we spend our way out of our current problems. 1990's Japan, here we come. However, my first ride was gold was very profitable for me and I enjoyed the ride. If you haven't already, make sure to check out the 5 Trends Video discussing the momentum of the major 5 sectors investors are watching. It gives good tips about oil, gold and other sectors. Oil still continues to be on my radar, but indicators have not confirmed a bottom yet, so I am still waiting for a good entry. I don't think there is much more downside for oil, but I can wait. As we saw today, these violent bear market rallies can take back profits just as quickly as they are given. FAZ and FAS are both very capable to take some serious slashes at your portfolio if you are caught on the wrong side of the rally, as some of you may have found out today. I plan to be very careful the next couple weeks with the leveraged ETFs. Having the Dow close under the 2002 lows yesterday and the S&P under the November lows confirmed that we are indeed still in a bear market. However, the rebound we received today also confirms that we may indeed be starting another bear market rally. So what does this mean? This is my plan for coming weeks. I am keeping my FAZ Put options (which is much like owning FAS, just more volatile) along with my remainder of SRS (which currently has a Market Club report trend score of +60. Get your own symbol analyzed for free, all you need is a name and email, Click Here) and SKF, which is not much. Besides my energy stocks and miscellaneous tech stocks, I will be patiently waiting. I am going to be very careful on the short side, as we may see a 15-20% rebound with this rally over the next few weeks. I may make some suttle long moves to take advantage of the rally, but not much. My real goal is to get the shorts back to a point where I can enter at some really low prices and be prepared for the big crash, which I still believe is coming. If we do indeed rally, many will believe the worst is done and that we could be starting the bull back up. Be very careful of what moves you make. As for myself, I feel very strongly that is not the case and will wait until the time is right to get back in heavily in the short position. However, I will be patient. We may not rally from this point, but we have a lot of indicators that we are oversold at the moment and that we could indeed see a strong bump in the bear market. Like today, these rallies could be violent, so watch out. I will try to make it on chat to keep you all posted daily on my moves. I am very excited for the times ahead. I believe the opportunity is slowly presenting itself to make a lot of money in this market. It's hard for me to fight off my compulsive nature sometimes, but deep down I believe it will payoff for me. So try not to worry if we do indeed see some green over the next few weeks and just think of it as an opportunity to see good prices for the shorts. At least that's my plan. Tomorrow, we'll talk about Obama's speech and other new factors as they come up. One more week for the $200 Lending Club promotion. If you haven't checked it out, make sure you do, click here for details. So far, my 10.5% return on investment with them has been picture perfect. It could be a great place to park some cash. Have a good night everyone, Happy Trading and we'll see you tomorrow. Geithner is so bad, he makes Uncle Ben look good. WIth the bar set so low, the market liked hearing from someone who is not named Tim and did not keep on pointing the finger at them. It was an excuse to rally. All Obama did 2nite is sell the stimulus plan he already passed and one small olive branch to Wall Street & Santelli as he called out home owners who bought houses they could not afford. If the market rallies its in anticipation that there will be some kind of conclusion to the bank drama. My sense is Obama will begin to use Bernake to use Republican rhetoric to offset his Hope and Change policies. Some of these bank preferreds have more pop than the stocks and are higher up in the capital structure. BAC.PR.L, BAC.PR.E and JPM.PR.S are good substitutes for bank equities. They actually outperformed their underlying equities. It will be interesting to see if they can hold their gains. They are still trading pretty stressed/distressed. Couldn't agree more 5U... Great comment, thanks. Let it be said, I am trading these bank preferreds vs shorts and it is a trade...not a long term investment! I actually think the equity on the banks is the shock absorber. And over time the preferreds will be converted into equity. But that is a conversation for another day as the banks will drag their heels to show what lies beneath their kimonos. It will be like the Crying Game. Very ugly. In the meantime trade the relative value as the government will try to hide how under water their TARP preferreds are until they can't. With these preferreds trading like garbage, what does that say about the TARP? Is it still ranked at 100 cents on the dollar? Probably yes! More fuzzy government math. I'm long these preferreds vs my shorts. Also long PFF July 19 calls. 80% of it is financial preferreds. The longer duration of the options is worth the extra premium as it won't decay on me over nite. I fight garbage with garbage! you mentioned today that you sold your Gold yesterday...as Gold plummets. Yet yesterday , you did not mention that as Gold skyrockets.What gives? "The selling volume was very low and the number of new lows were minimal, which was a sign that we were quite oversold." "We may not rally from this point, but we have a lot of indicators that we are oversold at the moment and that we could indeed see a strong bump in the bear market." The banks are still shaky.